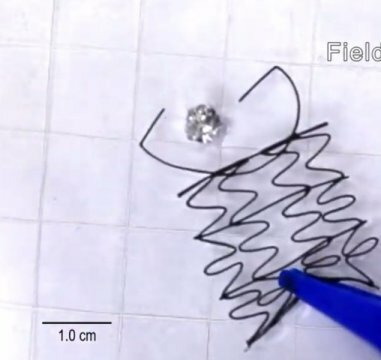 Researchers have created 3D-printed flexible mesh structures that can be controlled with applied magnetic fields while floating on water. The structures can grab small objects and carry water droplets, giving them the potential to be useful as soft robots that mimic creatures living on water surfaces or that can serve as tissue scaffolds for cell cultures. "This research shows capabilities in the emerging field of combining 3D printing and soft robotics," said Orlin Velev, S. Frank and Doris Culberson Distinguished Professor of Chemical and Biomolecular Engineering at NC State and corresponding author of a paper describing the research. To create these structures, the researchers made an "ink" from silicone microbeads, bound by liquid silicone and contained in water. The resulting "homocomposite thixotropic paste" resembles common toothpaste, which can easily be squeezed out of a tube but then maintains its shape on your toothbrush without dripping. The researchers used a 3D printer to shape the paste into mesh-like patterns. The patterns are then cured in an oven to create flexible silicone structures that can be controlled -- stretched and collapsed -- by the application of magnetic fields. "The structures are also auxetic, which means that they can expand and contract in all directions," Velev said. "With 3D printing, we can control the shape before and after the application of the magnetic field." Materials provided by North Carolina State University. Original written by Mick Kulikowski. Note: Content may be edited for style and length.